With its signature design and dual layer protection, the Caseology Parallax case is a stylish solution for protecting the Galaxy Note 8. The unique geometric pattern adds a modern feel to the phone, while the raised 3D texture provides a better grip. An improved frame also means a more secure hold for when you’re taking photos, streaming videos, or playing games. Whether you’re at work or hanging out with friends, this versatile case keeps your style on point and your phone protected so you can focus on what matters. 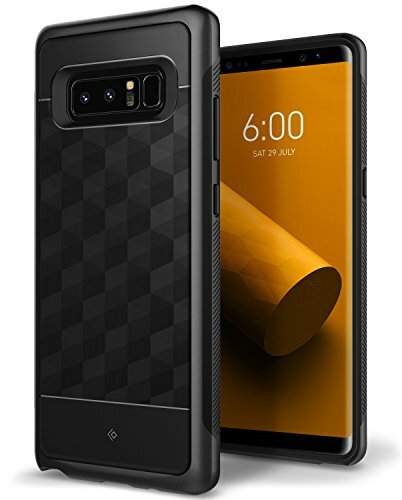 This dual layer Note 8 case combines the shock absorbing features and durability of TPU & PC material into one compact case. The sturdy TPU cover protects the back of your phone while the rounded edges of the frame protects the sides and corners. The raised front lip protects the edge-to-edge display when faced down and keeps the screen free from scratches. The Parallax’s comprehensive design also includes precise cutouts, tactile button covers, raised bezel protection and easy access to the fingerprint sensor.